The simplest or the strongest of these beings has been so designed upon by his experience that he has a wound and a nakedness to conceal, and guards and disguises by which he conceals it. Scarcely ever, in the whole of his living, are these guards down. Before every other human being, in no matter what intimate trust, in no matter what apathy, something of the mask is there; before every mirror, it is hard at work, saving the creature who cringes behind it from the sight which might destroy it. Only in sleep (and not fully there); or only in certain waking moments of suspension, of quiet, of solitude, are these guards down: and these moments are only rarely to be seen by the person himself, or by any other human being. A neo-classical column, round and fluted, stands upright. It carries some of the weight of the structure above it, but not as much as the nondescript square pillar standing at its side, covered in neo-baroque plasterwork, chipped and unloved. Behind this pragmatic partnership are shop fronts, their metal shutters down. Every surface sweats a thin film of grease, grime or gum. Weak daylight permits fluorescent tubes to glow dimly. The air is thick and heavy, rendered in shades of muted grey. If the classical column was, and perhaps still is, the symbol of the highest ideals of architecture, of ‘man and civilisation’ this is, surely, a scene of insulted majesty. Lise Sarfati steps into the piercing sunlight of colorful mornings. She sets up her tripod and camera. Various men are also stepping into that light. This is downtown Los Angeles. Skid Row. Maybe you thought skid row was an old-fashioned term for ‘hard times’ or ‘homelessness’. That is true, but it is also a real place, a place with capital letters. A place where the authorities have institutionalized the margins of society they helped to create in the first place. Skid Row is official, the place where destitution is accepted with the unimaginative inevitability of fast food or billionaires. Skid Row is a fact and a metaphor. A photograph is a fact and a metaphor. So is a photographer. And so is a stranger. All are made up of the specifics of their being and the abstract generalities they embody for others. Fact and metaphor co-exist but they are different. The disjunction leads to slippage and misunderstanding, presumption and guesswork. What are these photographs? And who are these men? 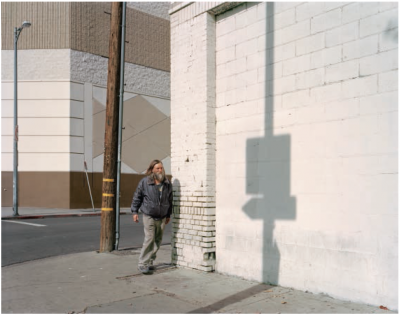 Sarfati frames her street scenes with the precision of an architectural photographer, giving form and purpose to sidewalks and buildings that had no expectation of being documented. She waits until into her view comes a man with equally little presumption, and an equally pragmatic facade. As he passes or pauses, the camera’s shutter is released. In one way or another each man mirrors his setting, the colors and patterns of his clothes affirmed by the walls; the texture of skin – sometimes light, sometimes dark – continuous with the patina of paintwork and concrete. A camera has a way of turning things into signs of themselves. Enigmatic signs, of course, because what the camera lays bare with ease it is unable to explain. It turns spaces into stages, figures into players, facts into metaphors. It makes the world theatrical and dramatic but in ways that signal that theatre is never all, and never enough. In a photograph mere fact may put itself forward as the proposition of a symbolic whole, only to slip back into mere fact, a collection of observable details. We know the spaces we make are not really stages. We know the people we see are symbols of nothing but themselves. But a photographer’s heightened perception may encourage us to heighten our own perception. This is why the drama of representation can be more compelling and more profound than any representation of drama. The drama of representation does not rely upon gesture, or the lost moments before and after the moment of exposure. Depiction is drama enough. Strip your Louis Quatorze of his king gear, and there is left nothing but a poor forked radish with a head fantastically carved. The light that creates these scenes is intense. The glaring sun and plunging shadows are uncompromising. To me this light suggests that experience that comes when we emerge from the darkness of a movie theatre and it is still daytime. The eyes adjust soon enough but the mind takes a little longer to make the transition from one world to another. The motion of the movie falls away, and your relaxed limbs must stiffen for walking. You squint into the brightness and what you see in those moments is lucid but disjointed, like the partial remnants of the film you have just experienced. We tell ourselves we go to the movies for the pleasures of the film as it unfolds. But what if we accepted that the unfolding is merely the prelude to the inevitable work of memory, with its unruly condensations and displacements (as Freud put it)? What if we accepted that the task of cinema is to leave us with vivid and partial moments? What if a two-hour movie is the booster rocket that falls away once it has put into our orbit just a single impression, indelible and inexplicable? Well, that would be more than enough. After all, most films are entirely forgettable. And what if a photographer, whose medium can only ever deal with the vivid and partial, accepted this and worked with it? Walker Evans (a man who knew a thing or two about photographing people on the street in bright light) once described Robert Altman’s 1973 film The Long Goodbye as a “marvelous bunch of photography”. It’s a movie about men expelled from the noir-ish protection offered by the shadowy past into the cruel sun of contemporary Los Angeles. There is nowhere to hide. Is the mystique of ‘man’ exposed for what it is? When Evans photographed men on the street he wrote: “Sometimes his hat is a hat, and sometimes he has molded it into a sort of defiant signature.” Sometimes a fact is a fact, and sometimes it’s a metaphor. We cannot know for sure, because the life that would explain these details is missing. In photography we only have clues. Lise Sarfati has spoken of the influence of filmmakers on her still photography, notably Robert Bresson and Jean Eustache. But it will do you no good to look for anything obviously cinematic in her pictures. It is no use pondering whether these photos were ‘set up’ (isn’t all photography both a set-up and a document?) There’s nothing to be gained from projecting narratives onto these mysterious epiphanies. No enlightenment will come from the forced construction of imaginary biographies for these men. No. Sarfati’s relation to cinema has more to do with those residues that movies can leave behind. A photographer can work with those impressions that insist on marking us for reasons we cannot quite understand. Feelings that come mysteriously from chance configurations of content and form within in a frame; visions that become their own involuntary universe. If all photographs now have a trace of the film still in them it is because they stand in this residual, mnemonic relation to the cinematic background of all modern experience. But we need not overstate this. All the arts are related to each other and each has its own qualities. Those qualities shape its dialogue to the other arts. How could photography not have a connection to cinema, theatre and painting; to literature, sculpture and architecture? And how could it not have its own characteristics? Lise Sarfati’s pictures seem thoroughly photographic to me, but not defensively so. In adhering to some of those things photography is so good at – framing, stopping, translating three dimensions into two, describing in great detail, evoking the specifics of time and place, suggesting relations between people and surroundings – a generous door is held open to the other arts. But just as importantly the door is held open to the world itself. The photographer stands and the edge of its doorway and says: ‘Look at it this way’. Depiction is, at heart, an act of affection and empathy. This may seem an unlikely claim to make in our era of automated surveillance and shop-soiled vision. But to make an image profound a photographer must look carefully and intensely. And in looking she must close the gap between self and other, while knowing that the gap will reassert itself in the formality of the final image. The viewer is then confronted with this gap. If it feels profound it is because the gap is understood as a sincere invitation to respond. Back to shades of grey, the color has gone. Metal shutters again, this time dappled by light filtering through the leaves of a welcome tree. A man stands (a woman with her camera stands watching him). Hooded he looks away. Above him is a shop sign. N.A.B Sounds. The picture is as mute as it is still. His back is straight. He is alert to something. Something beyond the frame. We will never know what it is. We do not need to know. There is more than enough to contemplate in the visible world.